Update: Best Buy Mexico has since changed all references to iWork '11 to iWork '09. 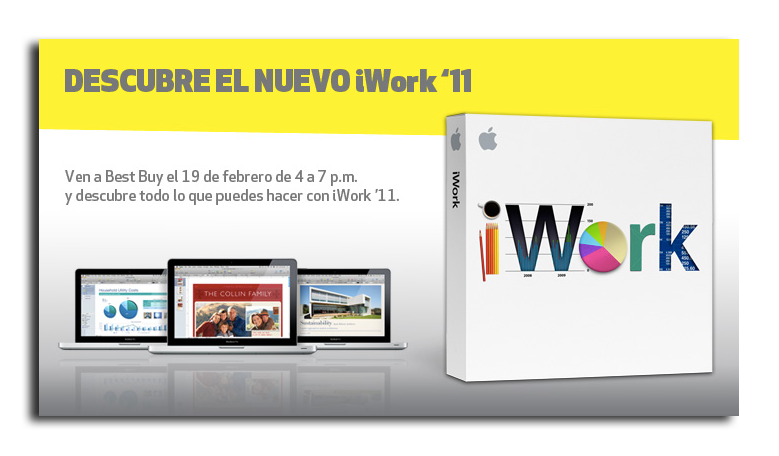 "Discover everything you can do with iWork '11," the site reads in Spanish. Customers can visit Best Buy this Saturday between 4 p.m. and 7 p.m. to apparently have a look at the software. The page was first reported by AppleBitch. The page also refers to the software as the "new" iWork '11, providing even more evidence that the page is not a mistaken reference to the current version, iWork '09. Apple last updated its productivity suite in early 2009. The box pictured on the page does not feature a date, and instead just shows the name "iWork" with the same logo and accompanying graphics featured with the last version of the software. Last year it was suggested that Apple planned to release iWork '11 alongside the launch of the Mac App Store in early 2011. Providing evidence that Apple may have planned as much, the Mac App Store touted the "amazing new iWork" when it launched in early January, even though the version for sale was two years old. Some have speculated that Apple could forego releasing the rumored iWork '11 on disc, and instead rely on the Mac App Store as part of an apparent effort to cease boxed software sales. However, the listing at retailer Best Buy would suggest that Apple will also sell an in-store version of the suite.